The origins of the temple dedicated to St. John the Baptist, later patron saint of the city, are still uncertain. According to tradition, it was founded in Roman times and dedicated to the god Mars. Several sarcophagi have in fact been found in this area, today in the Museum of the Opera del Duomo, as was the famous statue of Mars, which mediaeval chronacles tell us stood at the entrance to Ponte Vecchio. However some scholars think that the building was the Praetorium and the statue that of a barbarian king. Dante himself declared that his "beautiful San Giovanni" (Inferno, canto XIX) was a classical Roman building; excavations carried out in this century have in fact discovered remains of Roman constructions underneath the Baptistery and the Cathedral, built in the north-eastern area of the first ring of walls. The foundations of the first Baptistery of San Giovanni, dated from 4th-5th century circa, was certainly built on top of these ancient buildings. 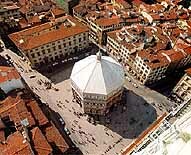 Its octagonal shape, the two lower orders, the attic and the springer of the cupola (in other words its basic architectural structure), date from the early Christian construction, which was possibly altered or completed in the early decades of the 7th century during the Longobard rule. The Church of San Giovanni became an official part of history on March 4th 897, when Amedeo, the Count Palatine and envoy of the Emperor, sat beneath the portico in front of the "Basilica of San Giovanni Battista" to administer justice. The church was apparently acting as the cathedral in this period in the place of Santa Reparata. The second historic date came on November 6th 1059 when, immediately after his election, the Florentine Pope Nicholas II reconsacrated the basilica, which was to be the new bishopric. 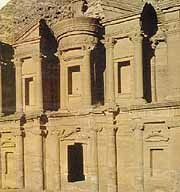 This reconsacration leads us to believe that the temple had in the meantime been radically transformed, or perhaps reconstructed. The eight segments of the cupola had certainly been completed by then as well as the semicircular apse which was added on the west side to contain the altar: the three doors opened on the other three sides. Bishop Ranieri was buried in the church in 1113. San Giovanni did not definitely abandon its position as a cathedral and remain as the Baptistery alone until 1128. At the time the sacrament was administered only twice a year, making several entrance doors necessary to allow access to the crowds of worshippers. We should remember that there were apparently 30.000 inhabitants in "Fiorenza" in 1172 and the new fourth circle of walls enclosed at least double the area of the third ring, built by Matilde di Canossa in 1078. 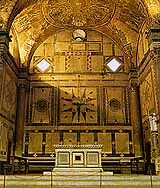 This was also the period (mid 12th century) in which the external revestment of the Baptistery was started: this masterpiece of white Carrara and green Prato marble inlay, geometrically designed in a harmonious classical style to cover the original sandstone, already shows signs of the search for spatial delimitation that was to lead to the perspective of the Renaissance. The final result is of great elegance that perfectly incarnates the artistic spirit of the Florentines; it was to become a prototype for Romanesque architecture in the city and used as a model by Leon Battista Alberti when he started work on the completion of the facade of Santa Maria Novella in 1470. The eight corner ribs decorated with strong green and white stripes (originally in grey stone) were instead more typical of the Romanesque style in use at Lucca, Pisa and Pistoia. The windows are also interesting, with their alternate pointed and semicircular tympani: a classical decoration that was used throughout the Renaissance. The marble revestment of the interior was carried out in the second half of the 11th century, though the new flooring, again in marble, was not carried out until the following century. Further work was carried out on the monument in the 13th century: the external revestment was completed and alterations were made to the semicircular apse, making it rectangular (1202); a start was made on the decorations for the interior, the rectangular apse was faced with mosaics (1225), together with the cupola (about 1270-1300). 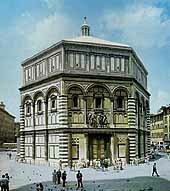 After having been a revolutionary building, as far as architecture was concerned, the Baptistery went on to become a laboratory for the new Florentine school of painting that originated with Coppo di Marcovaldo, Cimabue (active in San Giovanni) and eventually led to Giotto. By the 14th century plans were already under way for the creation of the new doors which also had to be worthy of the monument: the sculptor Andrea Pisano was commissioned with the first pair, which he carried out between 1330 and 1336, while Lorenzo Ghiberti designed and made two sets of doors, one pair between 1401 and 1424 and the other, known as the "Doors of Paradise", between 1425 and 1452. The sculptures above the doors are by Sansovino (1502, the East or Paradise Door), Giovan Francesco Rustici (1506-11, North Door) and Vincenzo Danti (1570, South Door, with doorposts sculpted in 1452-62 by Vittorio, son of Lorenzo Ghiberti). The two porphyry columns standing on either side of the Door of Paradise were donated to Florence by the Pisans in gratitude for the military help the city received in 1117 against Lucca, when its fleet was otherwise engaged against the Moslems in the Balearic Islands. The two columns are fractured, perhaps after one of the floods, though popular tradition would have it that they were already broken when they arrived, and hidden beneath lengths of cloth for this reason, giving rise to the saying "The Florentines are blind and the Pisans treacherous". The interior contains the splendid monument to the Antipope John XXIII, carried out by Donatello and Michelozzo in 1421-27.